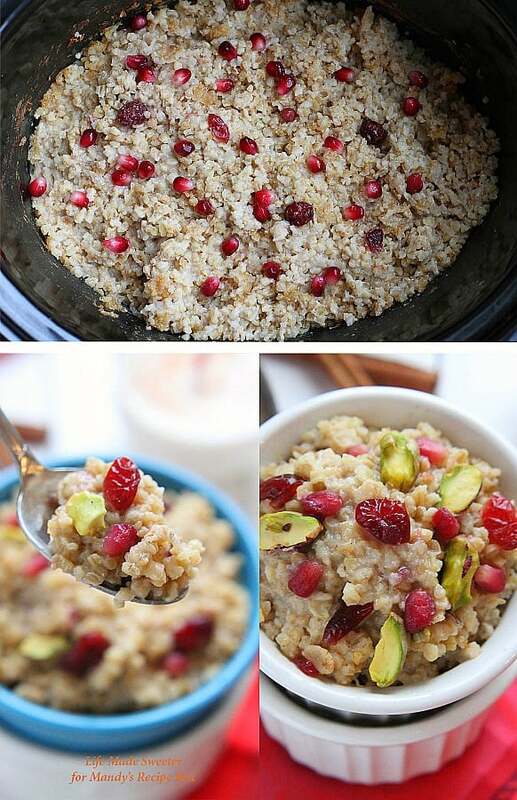 Cinnamon infused steel cut oatmeal with pomegranates, cranberries and pistachios made in the slow cooker or the stove-top. Hope you all had an amazing Christmas! We’ve had a great holiday so far visiting family and friends and indulging in lots of good eats and sweet treats. I’m just popping in here quickly today to share a healthier breakfast option you might need to get back on a more balanced diet in the new year. Steel cut oats are a great source of protein and fiber to help get your digestive system in gear after all the holiday indulging. They have a nuttier and earthier flavor than rolled oats but also have a lower glycemic index which can help keep you full longer and curb any cravings. They do take a longer to cook than rolled oats but I usually make a big batch at night and store it in the fridge to reheat during the week. After successfully making rolled oats in the slow cooker, I finally tried a few batches with steel cut oats. 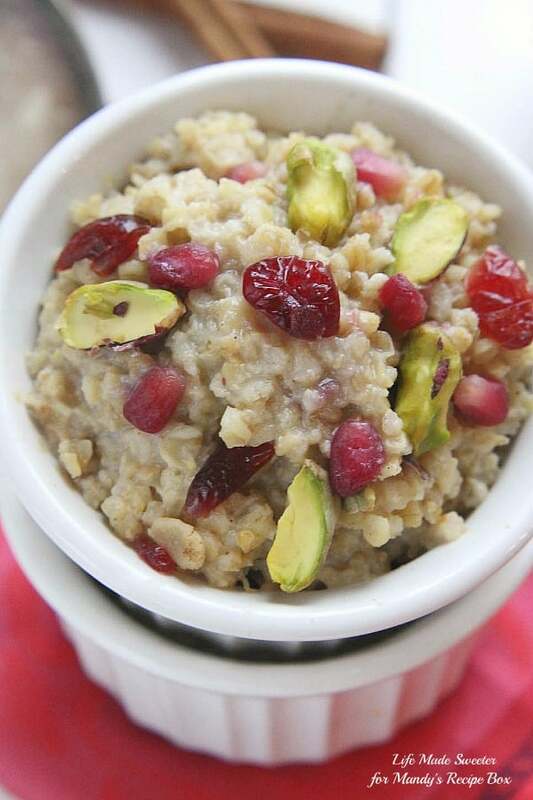 These Cinnamon Pomegranate Steel Cut Oats were a breeze to make and it was nice to wake up to a bowl of warm oats for breakfast with minimal effort. I prefer thicker and chewier oats so the amount of liquid you use will depend on how creamy or chewy you like them. The night before, I just added the oats together with pomegranates, dried cranberries, cinnamon and maple syrup . Pour some water, your favorite milk or even any leftover eggnog over everything — then cook it low and slow and keep it on the warm setting after it’s done until you’re ready to enjoy! Serve with another splash of milk, pistachios or any other toppings you like! 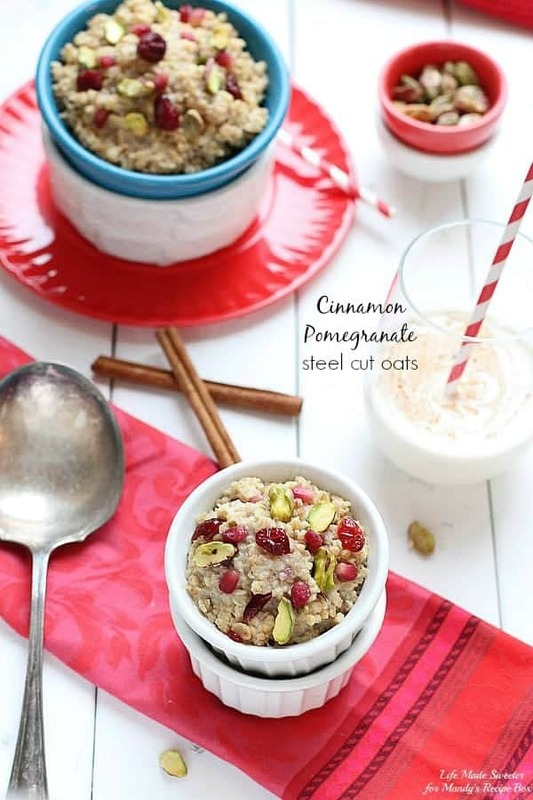 Head on over to Mandy’s Recipe Box where I’ll be sharing the recipe for these Cinnamon Pomegranate Steel Cut Oats today. Be sure to check out all of Mandy’s tasty recipes while you’re there!